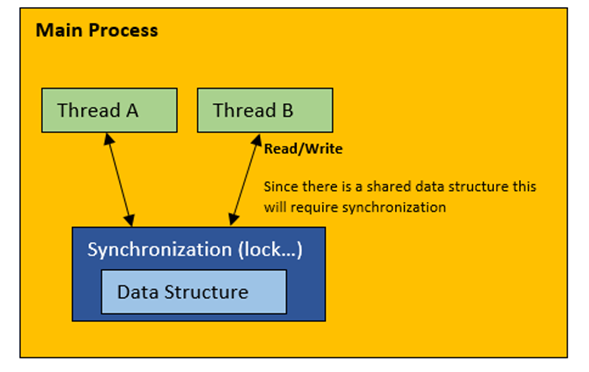 A nice way to think of Actors is that they may be used to alleviate some of synchronization concerns of using shared data structures. This is achieved by your application code talking to actors via message passing/receiving. The actor itself may pass messages to other actors, or work on the passed message itself. 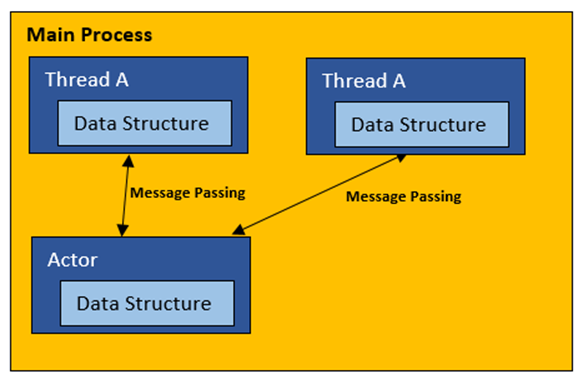 By using message passing rather than using shared data structures, it may help to think of the actor (or any subsequent actors its send messages to) working on a copy of the data rather than working on the same shared structures. Which kind of gets rid of the need to worry about nasty things like lock(s) and any nasty timing issues that may arise from carrying out multi threaded code. If the actor is working with its own copy of the data then we should have no issues with other threads wanting to work with the data the actor has, as the only place that data can be is within the actor itself, that is unless we pass another message to a different actor. If we were to do that though the new message to the other actor would also be a copy of the data, so would also be thread safe. I hope you see what I am trying to explain there, maybe a diagram may help. This may be an example that you think may not actually happen in real life, and to be honest this scenario may not popup in real life, as who would do something as silly as crediting an account in one thread, and debiting it in another…we are all diligent developers, we would not let this one into the code would we? We will stick with the same type of example as we did when we used a more traditional locking/shared data approach. And here is the entire code for an Actor that deals with Account actions. This example is deliberately simplistic, where we only debit/credit an Account by an amount. You could send any command to the Actor, and the Actor is really a general purpose in process messaging system. You would communicate with this Actor code using something like the following. Again, this could use any commands you want—this example just shows how to debit/credit an Account.